During this highly interactive seminar chiefly conducted by David Graves of GWS Media Ltd. we will review all aspects of marketing, you will be able to review your own current marketing strategy and you will leave with some clear ideas as to how that strategy could be improved with a view to increasing both turnover and profits. “If you are looking you join (or even experience) a business network in Bristol then this is by far the best! Not only will you get to meet some interesting and influential people in a networking format which is different and really works but you will also get the opportunity to attend free monthly seminars on a wide range of topics which will be useful to you and your business” David Doughty – named by Thomson Reuters as the UK’s top social influencer in risk, compliance and regtech in 2017. Originally written or should I say compiled as a resource for members of Business Network SW and then developed into a series of seminars. Now it’s the basis for a number of blog posts which I trust that you will find informative, useful and – dare I say, even worth sharing and ultimately even engage with. You’ll find the A – J’s at the end of this post! 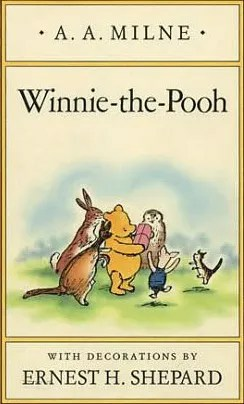 Kindness – If there is an opportunity to be kind – go for it. During a conversation there could be the chance to share something you know that could be helpful to the other person, it could be a link, it could be a contact, a company that you know who needs the skills that you have just heard about, it could be an invite to another networking event – I trust that you get the idea! It could be positive review (on one of those review sites….) or a recommendation on LinkedIn. Could you support the businesses within your network – purchasing something, engaging a service, even buying from those who things to sell – I’ve met people who create everything from works of art to fascinators to portraits to photographs to wine tasting experiences to gift cards for restaurants…..
You could comment on and share your favourite blogposts and articles written by those in your network and help them to get their message out to a wider network – connect on LinkedIn, follow on Twitter, and there’s Instagram, Pinterest to name but 4! When was the last time (or first time that) you called a client/customer and simply say thank you for the pleasure of doing business with them? Or sent them something – a card, a postcard or some bulky mail (even one of your propmotional pieces! And finally when you are networking at events and you introduce people in your network to each other, share something you really appreciate about that person (beyond their name and job title). Knowledge – you are an expert in your field – share what you know – top tips, what’s new in your world, what you’ve come across that may be helpful to others. 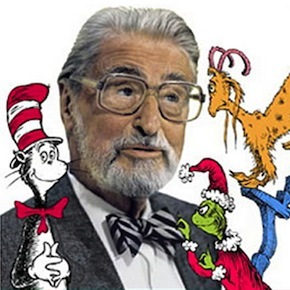 Ask others about what they know – even who they know! Learning from others – they are experts in their field – don’t be afraid to ask for advice – people like to help. Go to seminars – even if the subject/topic does not seem relevant you will pick up something that can be useful for someone else – a nugget of knowledge that can be shared. Thank you for reading this far – the next instalment will be available soon and please feel free to comment and share. In Person – Meeting people face to face is what networking is all about. Taking the time to go to events and take the opportunity of seeing people in the flesh (business attire) – it’s how business relationships are formed – in fact it’s how relationships are formed. If you need some research to show the “power of face to face” – the benefits of in person then here we go…….. I am sure you noted the key words from the infographic – collaboration, understanding, engagement, impact, communication, long term relationships and creating opportunities – networking I do believe! Inquire about the other person – see Bob Burgs questions C for conversation– be interested about them rather than just be looking to talk about you – or should I say I. Be “Innovative.” Most companies claim to be innovative. Most people claim to be innovative. If you are innovative, don’t say it. Prove it. Describe the products you’ve developed. Describe the processes you’ve modified. Describe how you have helped another business improve. Give something real so your innovation is unspoken but evident. It demosnstrates wht you do and shows why your clients work with you. Invest – Everyone attends networking events for different reasons. Make some time before you arrive to look at what you plan to achieve, who you intend to introduce yourself to and a specific outcome you’d like to walk away with. Investing wisely means your money (and time) will not be wasted. Invest in others – how can you help those that you meet – see abundance – share knowledge, experience, market intelligence, contacts. Invest your time in those people who may be new to networking (or just new to the event), those people who may be on their own – they are going to feel much better and so will you and who know’s where the conversation could go and what opportunities could arise. And the jargon includes all the acronyms that you may use – NLP, ACA, BDM, AIDA, B2B, B2C, B2E, COO, CEO, CMO, SEO, PPC, PR, EBITDA, RRP, PRP, PPS, VPN etc. etc. Join in – events have different aspects – seminars, speaker slots, some have support posts – marketing assistant, treasurer, membership etc. – get involved – opportunities will arise. 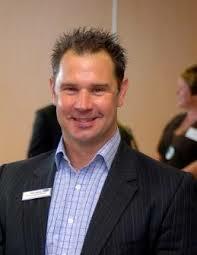 Business Network SW was established in 1993 and has been helping businesses build effective business relationships. Having heard this recently – and on vinyl I will add! I was casually listening as you do and there were a number of lyrics that caught my attention – words on networking! Thank you for your time and for singing along! With 2 minutes to spare…..
During the course of my daily research I discovered that Oscar Wilde was born on 16th October 1854. My daily research you may ask? I’ll explain what I mean! A top tip received from Guy Arnold (Founder of ‘Sales Through Service’: service systems that boost sales & sales systems that boost service.) led to my daily research – going the extra inch to make the difference in the way I do business! That’s where my research comes in – I record a new message everyday – stating the day, thanking the caller for calling; explaining when I will call back and finally a fact for the day! Facts are provided by Wikipedia – births, events, observances (i don’t do deaths!) and there has never been a day when I haven’t found one! I will confess that I do this Monday to Friday but I do know that there are facts that will be there for Saturday’s and Sunday’s! If you are going to network then be prepared for a conversation not a sales pitch or elevator pitch; ask questions that are unexpected and get beneath the surface. At an event, before an event, after an event think about what you can do for someone else – introduce them to others, share knowledge, share an opportunity even just get someone a drink or even more radical go and speak to someone who is on their own or even someone you have never met before! You are representing your business/organisation – it is Brand You so how are you coming across? More of Brand You – relax, enjoy, talk about things other than business – let people see the real you not someone who has just swallowed the corporate speak jargon book complete with synonyms, acronyms and the other business B***S***! Nothing to talk about at a networking event? Your diary, looking back and forward is a great place to start – it’s about you, what you do, the businesses that you help, the businesses and organisations that you are looking to help – need I say more? Guess what you should be working towards! How can you make yourself and the benefits that you bring memorable? Is it during the conversations that you have or is it the way in which you follow up? You do follow up don’t you? Not just with a spammy email or a newsletter with something that shows that you have paid attention and listened. 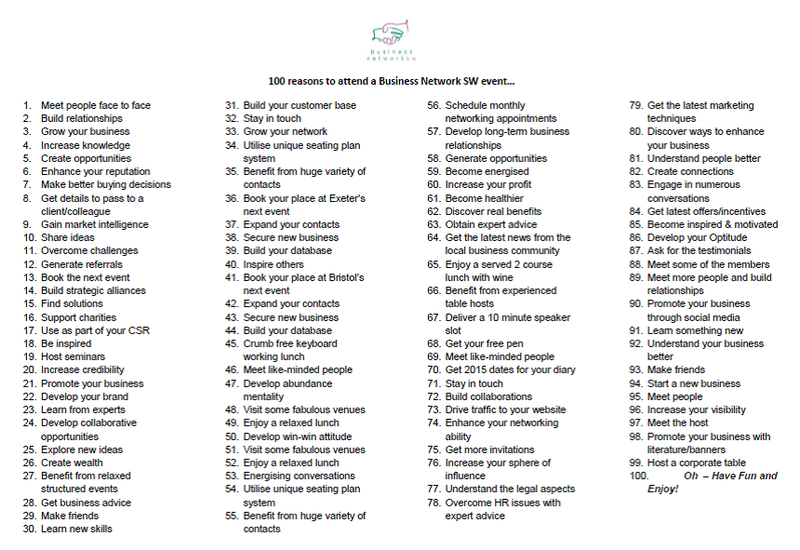 Following the Exeter Business Network event in May 2015 held at Exeter Racecourse and Conference Centre attended by over 50 people a “snapshot” survey was carried out – thank you to all those that completed them! Before I share the results here is a paragraph from a survey that was carried out to see how consumers viewed survey statistics – I am sure that there is a name for this! So I trust that the following will help you! 21 responses – a 42% return rate! Everything – I wouldn’t still be coming after all these years otherwise! Good collection of organisations represented and great atmosphere created. really enjoyed it. So having read this I trust that you as a potential consumer has got some accurate feedback on Business Network SW! We will certainly be looking to become better and the suggestions that have been made are great! They say that the proof is in the pudding and you not only get the pudding at an event you get…..
All for just £36.00 inc VAT covering seminar, coffee, 2 course served lunch with drinks – wine available, event programme, delegate list, dietary requirements are catered for. Cost of event for members is £32.00 (Inc. VAT) (visitors £39.00 inc VAT) covering seminar, coffee, 2 course served lunch with drinks – wine available, event programme, delegate list, dietary requirements are catered for. Delighted to have signed The Armed Forces Corporate Covenant and here’s why and how it is something that you could do as well! Firstly a bit of background…. The corporate covenant has been designed to complement the armed forces covenant and sit alongside the community covenant. The armed forces covenant sets out the moral obligation of society towards members of the armed forces community and the community covenant provides a mechanism for local authorities and communities to express support for members of the armed forces community. The corporate covenant is designed to allow businesses and charitable organisations to express their support, and commit to ways in which they can provide that support. The Employer Recognition Scheme rewards employers for their varying levels of support for the armed forces in relation to the corporate covenant, with Bronze, Silver or Gold Awards. Find out more here. Each organisation will also be encouraged to offer support in a way most appropriate to their situation and capacity, with the pledge document including a ‘menu’ of options for them to sign up to. This menu covers employment support for veterans, reservists, service spouses and partners, as well as support for cadet units, Armed Forces Day, and discounts for the armed forces community. There is also an opportunity for companies and charitable organisations to add their own commitments based on local circumstances. 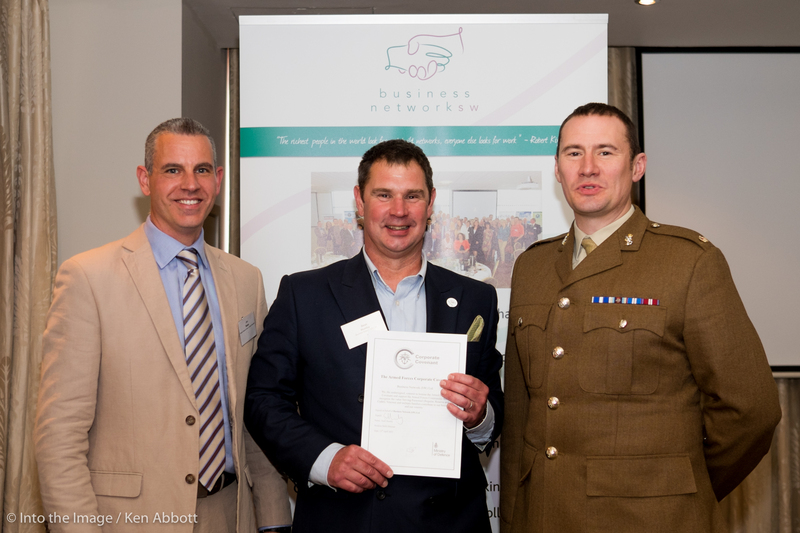 At the Exeter Business Network event on June 10th you can find out more from Jon Beake – Regional SaBRE Director with Wessex Reserve Forces’ & Cadets’ Association – along with a great seminar and numerous networking opportunities! 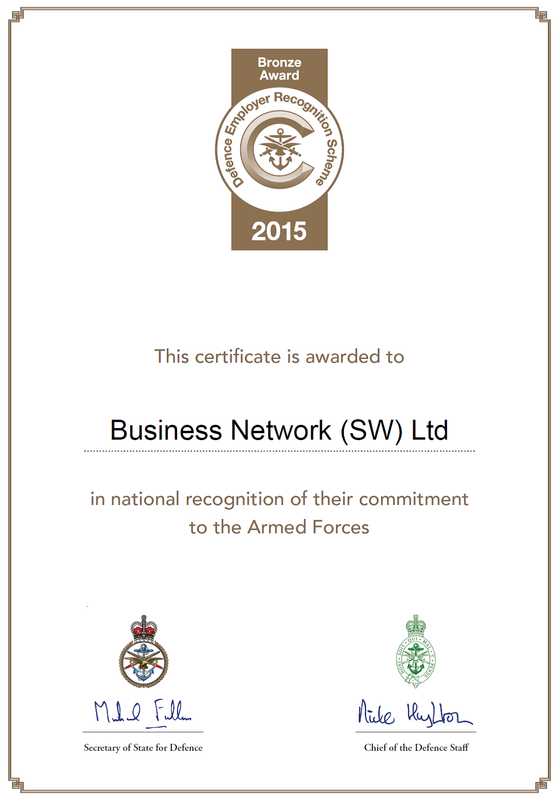 Delighted to also announce that Business Network SW has been awarded Bronze Award – one of numerous businesses who has pledged it’s support to defence and to take a positive stance towards existing and prospective employees who are part of the Armed Services community. Possibly because my father is an ardent twitcher and probably because of seeing geese so regularly whilst out and about I have always been fascinated by why so many birds fly in a V formation. A V formation (sometimes called a skein) is the symmetric V-shaped flight formation of flights of geese and from the research that has been carried out and published in journals such as Nature we can learn a lot that can be transferred into business and life! What follows are my interpretations for business and for networking! Goose fact 1. As each goose flaps it’s wings it creates 71% more uplift for birds that are following, so by flying in formation the whole flock adds 71% greater flying range than by flying alone. By growing and building your network both face to face and online (business contacts, customers, suppliers, friends, family, social groups, alumni, trade, online groups) and staying in contact with them you will generate opportunities – sharing a link, making that call, thinking of how you could help others and how others can help you are all part of a successful business strategy. A simple message is found in team; Together Each Achieves More. As the leader of the business, by definition, you are the vanguard, the main man/woman, CEO, MD and possibly everything else! And also by definition the person who needs to know everything, be an expert in everything from HR, health and safety, accounts, sales, marketing, customer service, commerce, IT, websites, social media, transport/logistics, fulfilment and then having to fit in your own life – family, children, holidays, the school run, leisure, sport, hobbies, food and drink, shopping, DIY and sleep. How can this be done in 24 hours? When do you get the time to do what you are best at – the service you provide, the product you designed, the expertise that people want? With your network you have unlimited expertise and people who can help you get what you want from life and business. And the best thing is that you will know these people, probably like them and that’s where the trust that is so important can begin! We need to ensure that when we honk we honk encouragingly. In groups/businesses/organisations where there is encouragement, the production is much greater. Communication is key – the right message, delivered in a way that people can understand and see how they can make a difference is key. At a networking event perhaps not so much honking as conversation. The conversations that you have should be about those that you meet and not a sales pitch from you. By asking questions you can find out so much about why a person you meet does what they do, what challenges they may have, what they are looking to achieve short term (long term), the successes they have had, what they are working on currently and when you do find this out then opportunities will start to become apparent for you and even better for those that you know. Try asking the unexpected question, the one that causes someone to stop and think – the answer will always be more memorable for all and give far more insight than “what do you do?” Although you have the opportunity to be memorable here – when asked what you do – stay away from the stock, standard response “I am an …..and I do ……”. A well known example is from Harley Davidson – do they build/sell motorcycles – no they provide experiences! Do I arrange a monthly networking lunch in Exeter – no – you have the best environment for a conversation that can lead to connections and collaborationsOnce the people in your network are all “honking” then there will be unlimited possibilities. If we have as much sense as geese then we will stick together in difficult times as well as when we are strong – collaboration can help for any business – as has been mentioned no one knows everything even if you are in the same business sector the expertise can be different even niche. A business going through difficult times can get through these with the support of the network. . Knowing where to turn for help is something that a network can provide – businesses that are sick can be saved if you know where to find the best expertise. With the people in your network you will be able to ask for the help that you need – if someone cannot help directly they will certainly know someone who can and the connection can be made. In conclusion any networking that you do (or are looking to do) can be very much like the geese in their formation – something that is second nature, common practise and that is mutually beneficial. If you can apply this to your networking then you will undoubtedly become more successful! The environment Business Network SW provides is relaxed and business focused to ensure that you and your business get the most benefit. Guaranteed conversations leading to connections and collaborations. Guaranteed you’ll leave be better informed and connected than when you arrived! George Washington’s rules when in company and conversation – first ever networking tips? Reading these today for the first time and you realise that they could and should apply to our everyday goings on – and when it comes to networking – this must be the first and definitive guide to networking ever written! The rules have in common a focus on other people rather than the narrow focus of our own self-interests that we find so prevalent today. Fussy or not, they represent more than just manners. They are the small sacrifices that we should all be willing to make for the good of all and the sake of living together. These rules proclaim our respect for others and in turn give us the gift of self-respect and heightened self-esteem. In 1884, the first long-distance telephone call was made, between Boston and New York City. Join us for a dive into the world of Google. When we think of Google we mostly think of searching for information or perhaps advertising. Well Google actually has over 230 products or services in its arsenal and we are going to have an interactive session where we have a look and play with a number of business tools that Google provide. And if that wasn’t enough we are also going to build an app live in front of you in 90 mins. You set us the challenge and we will build it! Intelligent Assistance – building new ways to interact with technology – using voice and text conversation. Computer Vision – enabling mobile devices to measure physical spaces, recognise their environment and identify things. Virtual Reality- bringing amazing experiences to everyone. Machine Learning – injecting artificial intelligence into business. What you can take away – your notes, actions, ideas, follow up – sharing your discoveries! We have all heard about the large-scale computer and network intrusions, denial of service attacks, ransomware, and malware development. Any of which has the potential to ruin a business, it’s reputation, it’s finances and more. During this interactive session they will offer you guidance based on the very latest cyber threat intelligence from the National Cyber Security Centre including Cyber Essentials and 10 Steps to Cyber Security. Protecting your business and reputation for just £39! 1.40pm – 10 minute Speaker – informative, entertaining and always worthwhile. Your Investment is £39.00 (Inc. VAT) for coffee, 2 course served lunch with drinks – wine available, event programme, delegate list, dietary requirements are catered for.